Writing bug has taken my weekend. Here is an other view of the free library. I put a floor in the porch. There is still a small gap I plan to fill in, but it has been so cold lately the idea of setting up the table saw in the garage hasn't seemed that appealing. It is a simple cut and just needs to be done. With the new truck in the driveway I have been parking in the garage. So using the table saw requires effort. For now I have had enough to do that such effort hasn't been high priority. My FPGA development board arrived today, and I had planned on playing with this. Instead I got a writing bug and spent most of the evening doing that. Work on the free library continues. With how well the porch roof turned out I decided to redo the main roof. I was wondering how I would get it apart, but a stiff pressure broke the glue cleanly. With the belt sander I beveled the edges of the main roof and was able to get a much better fit. I glued this up and used my picture frame clamp to hold the shape while the glue dries. I also removed the front door of to work on the siding separately. When I first attached the door it end up not lining up correctly because it was sitting on the floor. So I need to reattach the hinges to correct this problem. The siding on the front moves slowly. I started by doing the siding around the porch, then added trim around where the porch roof is expected to meet up. Next I will add the siding for the rest of the front wall, but with other projects this has been holding for a bit. Dinner this evening with Sean, Amber, Pokie, and Mira. Snow today, about 2 inches. Did I need to use a snowblower to clear this? No. Did I use one? Indeed. It was the first real test of this device we purchased as a house back in November. December had no snow and actually warmed up and melted all the snow brought in by November. So this was the first time we ever started the machine. Adjustments had to be made for the heights as it wasn't sitting all the way on the ground to grab the snow, but after that it works great. I wasn't able to give the machine a heavy load test as we just didn't have enough snow to move. But the sidewalk on the north side of the house had drifted to about 4-5 inches, and the machine went through this with no signs of effort. It has been very cold lately with temperatures at or below 0° F. In addition there have been strong winds. So for outside activity I have been putting on my usual layers and a three hole balaclava. I like the new balaclava as it covers my nose but had a hole just below the nose so it doesn't impede breathing. But my mittens couldn't keep up with the temperature and my hands got cold. After more than 20 days in transit my "gift" from Hong Kong arrived, a 10 watt LED driver. It had been my plan to replace the very dim bulb in my microscope inspection station with an LED. My initial attempt used a 1 watt LED, but it didn't produce the light output I desired. So I found a 10 watt LED. However, I forgot that hooking up a 10 watt LED isn't trivial. LEDs like a constant current at some voltage. With smaller LEDs one can get away with putting in a resister to limit the current for the given voltage. While this would work for the larger LEDs the current limiting resister needs to be able to handle a lot of power and is a pretty wasteful setup. 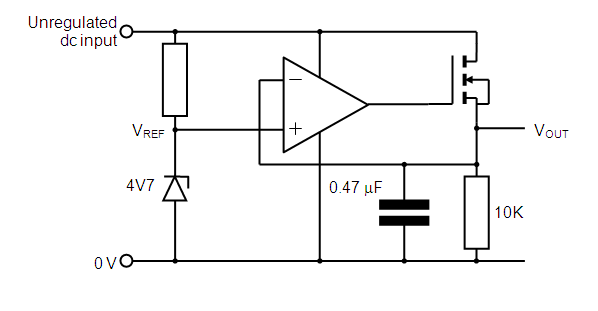 One alternative is to use a current sense resister in a feedback look to turn on a FET which will limit the current. In it's simplest form this is a resister, transistor, and FET (like this). More complex versions use an op-amp in place of the transistor and a Zener diode for a reference voltage (like this). And some use an IC that integrates most of these parts. I'm pretty sure the controller I have is of the first type. Now that I had everything it was time to see it go. I used my bench power supply to give the device 12 VDC (it says it takes 12-14 VDC). Sure enough the LED was glowing bright. Then I inspected the back of the control board. I saw what looked like four diodes on the power input section. That says to me this is a bridge rectifier. The inputs were not labeled positive or negative, and it was my guess I could put AC on the input and still have this thing work. My microscope has a 120 to 12 volt transformer that should handle 10 watts (the old bulb was 10 watts). So I decided to try it. Sure enough, it worked just fine. That saved me from having to put my own bridge rectifier and filter capacitor. The last step was putting the thing together. Turns out the first 10 watt LED I ordered had a shape that would fit into the old bulb housing if I bent the power pins. So this is what I did. Then I was able to use the three section body to hold each of the parts. When I was done, everything fit perfectly and I have a fully assembled light that looks unaltered. How does the new light work? Much, much better. The circle of light thrown by the 10 watt LED is much better than the 1 watt LED or the 10 watt light bulb. I did a quick viewing of some electrical components with no other light source and I can tell this is going to work fine. The only thing I need to consider is some kind of heatsink for the LED. Right now there isn't one. I haven't been running the LED for too long so I shouldn't be causing any damage to the LED. However, I am going to want something that is able to dissipate the heat so I can use it continuously. I shall ask the mechanical guys at work what they recommend for my setup. Right now, though, I am pretty happy with the results. The Pünkerjünker has served Xiphos for several years, but the last couple it has been hanging on by a thread. It is time for the trusty beast to retire. Xiphos and I have been talking about buying a truck that will serve as a replacement and combing Craig's List for the last couple months. The other day we saw an ad for a truck that seemed to be everything we were looking for. It was an hour and a half drive away and we loaded up to make the trip. After inspecting the truck and giving it a test drive both of us were fairly convinced this was exactly what we were looking for. We throw a large wad of cash at the guy, ran away while he was picking it up, and now have a Toyota Tundra. This truck is much larger than both the Pünkerjünker (an S10) and Big Blue (an S15), packs a V8 engine, 6 foot bed, and crew cab. While the bed is shorter than the jünker's, the crew cab makes up for it. Since Xiphos mostly hauls lighting equipment the larger cab gives him room for lighting gear he doesn't want exposed to the elements (such as his board). The truck came complete with dents and scratches so we don't have to add them ourselves—it's important for people to know this is a work truck and not phallic compensation. Pictured is Xiphos at the helm of his new wheels. The smile may have to be chiseled off his face as I'm afraid it hasn't moved since he first drove this new vehicle. Fixed the Odroid I/O shield. A day or two ago I finally received the USBTinyISP I ordered, presumably delayed by the increased shipping from the holiday. Now I could reprogram the replacement Atmel ATMEGA328-P that died on the I/O shield. But first I had to remove the dead CPU. Back in September I picked up a soldering station with a hot-air rework wand. In theory that should have been able to heat the part to remove, but I had never actually done this before. I pulled out my microscope inspection station, fired up the rework station and decided to give it a shot. I was rather surprised that after heating for a few second I used the suction cup and pulled the CPU cleanly off the board. To put the replacement CPU down I first used twisters to position and hold the chip, and my soldering iron to melt one pin down to hold it in place. After that I used the rework station to melt all the solder. Not feeling all CPU pins were making a good connection I used the soldering iron to touch each pin's pad to make sure it also conducted heat to the pin. It only took a couple of minutes and the replacement CPU was soldered down. I used the programmer and quickly had the bootloader in the processor. This meant that the CPU must be at least mostly connected. I then reconnected the I/O shield to the Odroid and got the system on it's feet. With the Arduino tool I loaded a sample program to flash an LED. When I saw that it was working, I knew the change was functional. The solar powered web server project has been on hold for over a month because of this setback, but with hardware again operational the building can proceed. Since I have been using an Arduino more lately, and I really like the setup, I think I might build my power circuit on the breadboard first. Using the Arduino I can test to make sure it is doing what I want. I can put all the brains of the power monitoring in the Arduino, allowing the serial interface to query power but leaving the decisions about power control to the Arduino. That was if I mess up my breadboard circuit and fry the CPU like I did with the I/O shield, it's fairly easy to replace. A day or two ago I finally received the USBTinyISP I ordered, presumably delayed by the increased shipping from the holiday. This will allow me to program the blank ATMEGA328 CPU for Xiphos' DMX LED controller. First, I needed to get software into the CPU. So I swapped out the CPU on the Arduino with my new blank part. Then I connected the USBTinyISP. But when I tried to load the bootloader I got a message about the signature not matching. Turns out that although I thought I picked up the exact same part, I didn't. All that was needed was to change a line in avrdude.conf so it was except the different signature. That took care of the error and the bootloader was loaded. I then had to change the signature back to the original so I could load a program into it. I started with the example that flashes the LED just to be sure the CPU was working, and it was. I then programmed in the DMX code. Now it was time to place the CPU on a board by itself. My second breadboard had plenty of room left, only holding the 485 transceiver chip. Using the first drawing I found of the CPU connected to a crystal I could find, I quickly had the device wired up. The DMX controller is setup to flash an LED on pin 13, and so when I connected an LED to this pin I would be able to see if the CPU was working. Sure enough when I powered up the device I saw the LED flash. This is the first time I've used a crystal oscillator in a circuit I built myself, and I'm glad it worked so well. Once I knew the CPU was working I started transferring all the FET control lines from the Arduino board to the new device. I went well but on occasion the CPU would halt. I added some capacitance to the 5 V lines and that cleared that problem up—I just needed a little extra power storage when switching on those FETs from the CPU. The setup is now stand-alone. I told Xiphos he can solder everything together himself—I seem to blew stuff up when I do that.